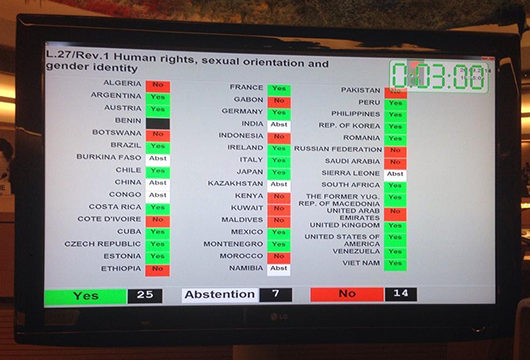 The International Gay and Lesbian Human Rights Commission (IGLHRC) today applauded the United Nations’ top human rights body for approving a resolution condemning discrimination based on sexual orientation and gender identity, calling it an important step forward toward progress for equality and human rights for lesbian, gay, bisexual and transgender (LGBT) individuals. The Human Rights Council resolution—led by Brazil, Chile, Colombia, and Uruguay—followed a resolution in 2011 on the same topic led by South Africa and asks the UN Office of the High Commissioner of Human Rights to gather and publish information on how best to overcome discrimination and violence. Opponents of the resolution employed procedural tactics to defeat the text, by presenting a total of 7 amendments that would have eliminated all reference to sexual orientation and gender identity from the text, and made it applicable only to countries who proactively declare support for sexual diversity and rights. These amendments were defeated by vote. The resolution passed by 25 votes in favor, 14 against, and 7 abstentions. LGBT activists and allies from around the world have advocated strongly to bring about a resolution that would ensure regular attention at the Human Rights Council to violations based on real or perceived sexual orientation or gender identity. An earlier version of the resolution had reflected more of that vision, requiring the OHCHR to report biannually. The regular reporting requirement was stricken from the text during negotiations. On Friday, while some expressed disappointment with the limitations of the resolution, activists from across the world celebrated its symbolic value.